This website is devoted to the boundary marks set up by the Corporation of the City of London under the various coal duties Acts. 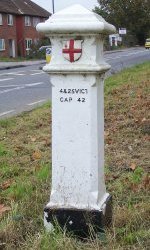 The main type of marker comprises the white cast-iron posts found on the outskirts of Greater London known variously as "Coal posts", "Coal tax posts", "Coal duty posts", or "City posts". Each page of the site (except this one!) has "breadcrumb trail" navigation near the top to enable you to return to higher levels in the structure. In addition, each has links near the bottom of the page to enable navigation to the main page of the section and to other pages within the section (to next and previous pages chronologically in the historical sections). There is also a Site map which displays the overall structure of the site and a What's new on this site page giving details of major changes.